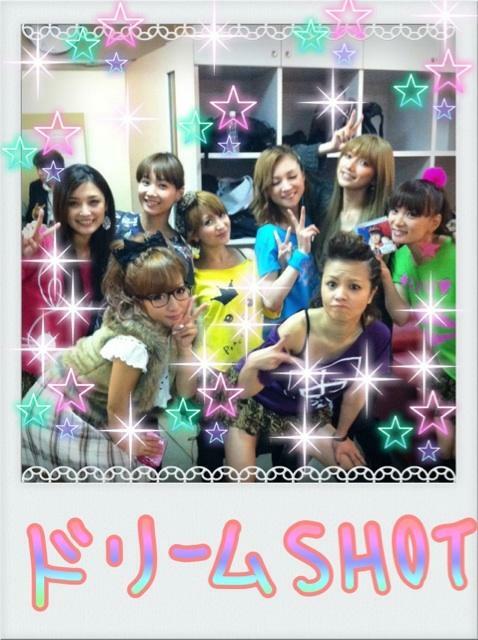 That’s right, it’s Ex-Morning Musume member Goto Maki visiting Dream Morning Musume! Not only that, she visited them on stage! Now, while Gocchin isn’t my favorite OG (I like her, but prefer others), just seeing her on the stage with the rest of DMM makes me really excited. After leaving Hello!Project/UFA and joining Avex, it seemed like she was almost blacklisted. She never came back, and was rarely (if ever) mentioned by other members. She wasn’t as taboo as Kago Ai, but she wasn’t very easy to hear from. Then, I wonder, perhaps this is because she’s splitting from Avex? She hasn’t gone on hiatus yet, but her intent is clear. So now, there is the inevitable question “Will Goto Maki join Dream Morning Musume?” which I have to answer with a tentative “probably not.” Gomaki joining DMM would be a dream come true for a lot of fans. Yet her Avex career was doing pretty well. She isn’t retiring out of lack of interest or poor sales; I genuinely believe her when she says she’s taking a break for herself. DMM would probably be fun for her, I imagine, but it would be a lot of work when she really could continue her solo career with Avex and do just fine with that. Still, the fact that Goto Maki is able to stand on the same stage as DMM with Tsunku/UFA’s approval shows that there is still more opportunity for H!P fans to see more of Goto Maki, which I think has to be considered a good thing. I’m a bad blogger, I know. Well, school’s back in the swing of things now, but I needed to post about this! I’m sure the internet community knows already, but a group consisting of Nakazawa Yuko, Iida Kaori, Abe Natsumi, Yasuda Kei, Yaguchi Mari, Ishikawa Rika, Yoshizawa Hitomi, Ogawa Makoto, Fujimoto Miki and Kusumi Koharu called Dream Morning Musume has been formed and they’re releasing their first album! Many of us have known that there would be a tour featuring these OG members this spring, but now they’re adding an album and some fall tour dates. 1. Group name is super appropriate. As a fan of these OG girls I can’t WAIT to see them in action. I’ve heard people take issue at the fact that they’re using the name “Morning Musume” when that should be just given to the current line up, but to me and to quite frankly the majority of Japan, THESE girls are Morning Musume, not the current line up. I love the current girls, don’t get me wrong, but not calling this group MM would be just wrong to me. 2. As a fan of these girls I’m super excited! My favorite idol still has a recording career, hell yes. 3. At first I did not want Koharu in this group, but now I’m getting closer to accepting it. I have nothing against Koharu, but she really doesn’t seem to fit the golden era-ness of this group. All these girls were in H!P in the 2001-2002 era that’s really memorable; Makoto fits in near the end of the golden era and Mikitty was a soloist. However, I’m kind of intrigued about how Koharu will fit in with this group. I don’t know if it WILL work, but I’m interested. 4. In that video I posted, Yuko going “I’m 37! !” is my favorite thing ever. Please keep it up, Yuko, I love you. 5. I’m not sure about the longevity of this group, but I certainly hope that there’s a good deal of longevity. I’ve heard rumors that H!P’s stated that this is in fact a temporary unit, but if that was the case then the title of their album “DoriMusu 1” (Dreams 1, haha, puns) would be insanely misleading. Still, Nacchi going “we’re going for the Newcomers award” makes me think that they might be here to stay, which I would be very very pleased with. I can’t wait to get their new album DoriMusu 1, which is mostly covers but two new songs!